SOLD: This is an empty bottle of Laudanum, which was consumed in the 19th century for its relaxing properties (you may know it from the movie From Hell). 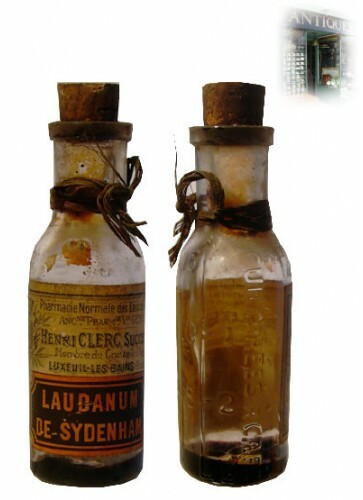 SOLD: Laudanum is an alcoholic tincture of opium, sometimes sweetened with sugar and also called wine of opium. 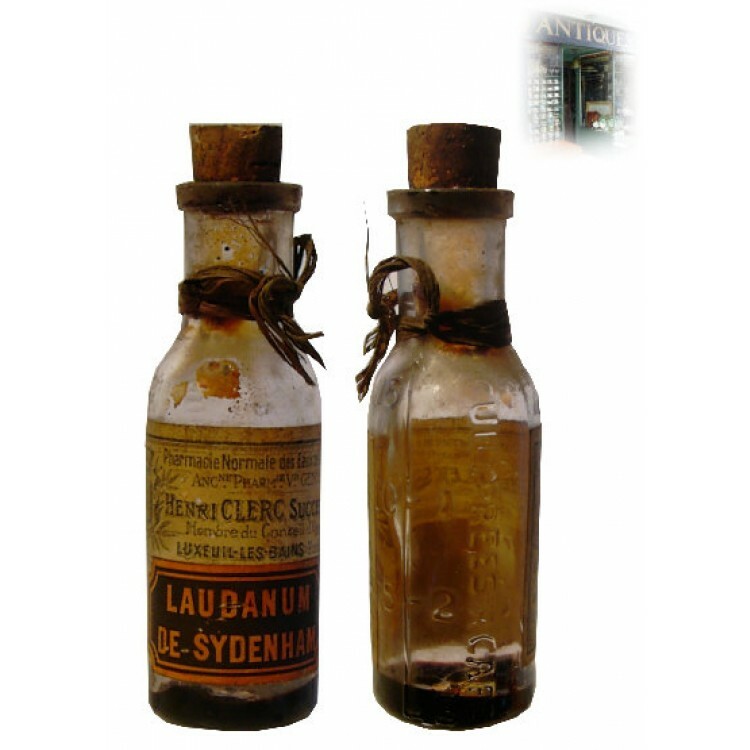 The 19th century was marked by the widespread use of laudanum as it was cheaper than a bottle of wine as it was not taxed as an alcoholic beverage. The addictive properties were not known and in some cases Laudanum was consumed with Absinthe, like Johnny Depp does in the movie "From Hell". This small bottle is empty, but still has its original cork (don't try to consume any of the substances that are still in the bottle, this is highly poisonous!). On the side of the bottle you can read "Cuillerées a Cafe" and a measuring scale. We can not sell real laudanum, as it is a controlled substance. But if you are interested in the effect, maybe Absinthe Strong68 and Thujon 33 are the right products for you. Just give them a try! In the movie From Hell Johnny Depp drinks Absinthe with Laudanum. He also lights up the sugar cube on an Absinthe spoon by setting the Absinthe itself on fire. This fire ritual is very dangerous and actually not an historically authentic ritual. It is in invention of Hollywood that unfortunately stayed in mind of many people after watching the movie. Therefore many first-timers still light up their Absinthe and wonder, why the glass suddenly cracks... Therefore once again, the real Absinthe drinking ritual is just with ice cold water and a sugar cube, no fire (and no laudanum). Watch our Absinthe Ritual section and see, how you drink Absinthe the original way.